Glossary in Word table, Excel spreadsheet or txt file. 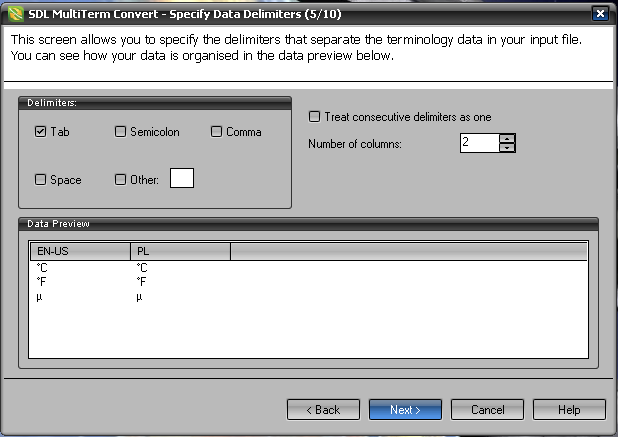 In general, the simplest way to start importing a glossary is to prepare/open it in Excel (or Calc from OpenOffice). Mind you – while MultiTerm Convert (Convert in short) can import directly from Excel files, it sometimes doesn’t work without any apparent reason, therefore my workflow includes saving Excel files in external format. The glossary terms have to be ordered in columns, the source and target term in the same row, but not necessarily adjacent, i.e. there can be other columns between them (e.g. definition, additional information, etc.). However, it is extremely important that the first row of the file contains descriptive headers: language name for the terms and relevant info for other fields (e.g. Definition, Gender, Source, Comment, etc.). What’s more, we should always use the same language names when importing from different sources to one termbase (eg. use English or EN or EN-US, but do not mix them). While it is possible to import several glossaries to one termbase, thus aggregating them, mixing language descriptions will lead do many problems later on. Table in a Word file: select table, copy it and paste into new Excel worksheet. Go to point 1. Excel worksheet: go to point 1. Text file with tab delimited values (aka csv file): go to point 2. Save Excel file as Unicode text (to preserve all language-specific encoding). For Excel 2007: round Office button > Save as > Other formats > Unicode text (*.txt). The columns will be separated by tabs. In the example below I have used the simplest glossary possible, containing only English and Polish terms, without any additional fields. Select New conversion session > Spreadsheet or database exchange format. Browse to your .txt file saved from Excel (remember to close Excel after saving, because otherwise it will lock the file, preventing import). Select proper number of columns, make sure everything looks OK. Selection of data separator (usually Tab), ability to select proper number of columns to import (we can ignore some unnecessary columns). Preview in the lower pane makes it easier to select proper settings. 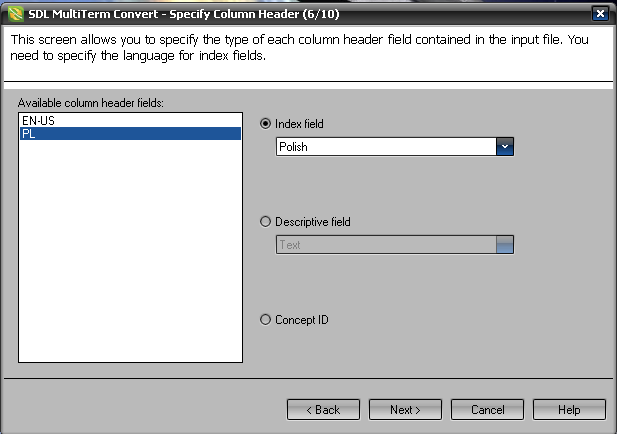 In the Available column header fields select language headers, choosing right language for the Index field. 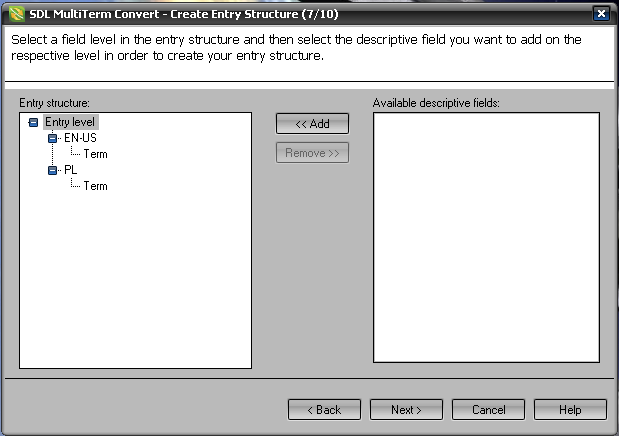 Very important step - you have to select which fields (columns) will be indexed, i.e. which contain terms for your termbase. Take care to select proper language from the drop-down list for the each language. If there are any additional fields in your file, mark them as "Descriptive". If everything was done properly, you should get a tree-like entry structure with “Entry level” on top with two (or more) languages with “Term” field for each. If there are any additional fields (description, source, etc. ), you can add them to the proper tree level. After finishing this step click “Next” in the subsequent windows. Start MultiTerm. In the Termbase menu select Create TermBase. 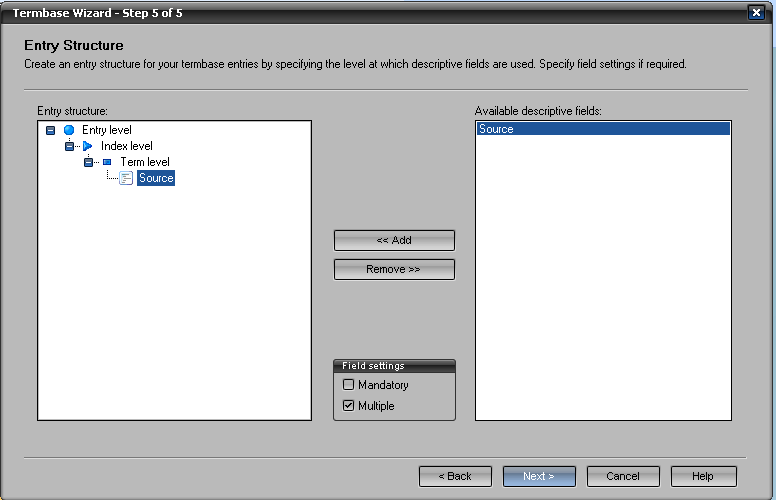 In the Termbase Wizard window enter a name for the termbase and choose Load existing termbase definition file option. Select the .xdt file generated by MultiTerm Convert. Now you can click Next in all Wizard windows, unless you want to actually change anything – see picture below. Creating a termbase from definition file. I have added a descriptive field named "Source" for the term level, which was not included in the imported glossary. Since there can be more than one translation for the term, so I want to be able to record the source of the particular definition. OK, that’s it. Termbase ready… but wait! Where are my terms? Well, you only created a termbase, now you have to import the terms separately (crazy, I know). 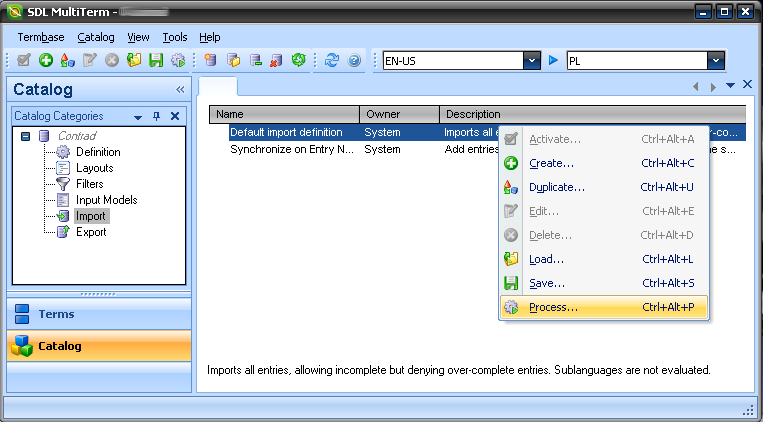 Older versions (up to 7) menu Termbase > Import entries > Process and select the .xml file created by MultiTerm Convert. Version 8.1 (from Trados Studio 2009): Catalog tab > Import > right click Default import definition, select Process and select the .xml file created by MultiTerm Convert (brilliant, isn’t it?). Where to find the "Process" command for the terminology import. In case of importing problems, you can use any text editor to take a look at the .xml file generated by MultiTerm Convert and check, if it has a proper (logical) structure – don’t be afraid, it is not so complicated. This way it is often possible to discover the reasons for failed import – for example, the same language defined twice. Marek, THANK YOU VERY MUCH! 🙂 At last, with your help – and thanks to you not much time for search, after many efforts – I am able to create new Multiterm bases from Excel (*.xls*) files. Your advice is really great and helpful. Thank you and all the best to your and yours. I’ve followed the instructions and converted an existing TM (Excel-format). But when I try to create a termabase and choose “Load existing termbase definition file option” and select the .xdt file generated by MultiTerm Convert an error occur and the software crashes.